On Thursday morning a good number of Breeders' Cup entrants galloped over the track at Arlington in preparation for their big day on Saturday. The weather was chilly with a constant light rain and the track looked to be wet fast or good. Check here for Friday's morning workouts. Below are photos of some of them. Click on the small image to see a larger version. 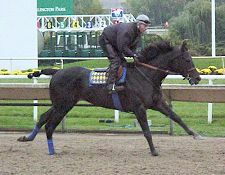 Classic favorite War Emblem was out for a jog and some gate training. 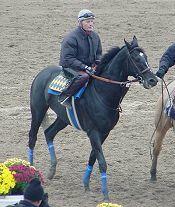 Trainer Bob Baffert said: "We stood him in the gate today. We wanted to make sure all was right, and you never want to mess with the man with the button (the starter)." Everyone was waiting to see War Emblem and he was followed by a mob of media as he came on the track. Here he is returning after his work. 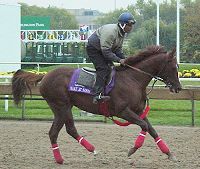 Evening Attire, listed at 8-1 in the morning line for the Classic, was also out on the track this morning. 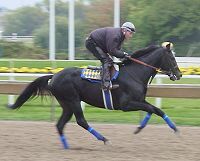 Classic longshot Dollar Bill was out for an easy gallop. 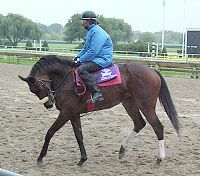 Trainer Dallas Stewart said : "He went great. We're very happy with him." Distaff favorite Azeri walked the track and galloped 1 1/4 miles. She has never run on a wet track before, but trainer Laura de Seroux said: "I don't think the track will be bad, but if it is off, Jade Hunters (Azeri's sire) have an affinity for mud." 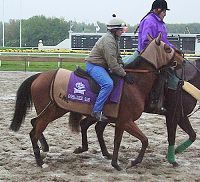 Mandy's Gold, 12-1 morning line in the Distaff, jogged 1 1/4 miles and galloped 1 1/2 miles. 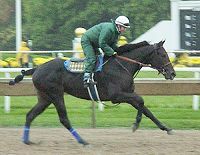 Distaff longshot Starrer galloped 1 1/4 miles. Local longshot Two Item Limit, who jogged and galloped this morning, was one of the last horses to leave the track when it closed for works this morning. Golan, second favorite in the Turf, breezed 3 furlongs in 38 flat on the turf course and galloped out there for quite a while. Ballingarry, the 5-1 co-third choice for the Turf, galloped 1 1/4 miles. Second choice in the Juvenile, Vindication, was one of several Bob Baffert babies to go out for an easy gallpop this morning. None had their name cloths on making identification a problem. Next in favoritism in the Juvenile is Toccet, winner of the Champagne, who galloped 1 1/4 miles "strong" at a two-minute lick. 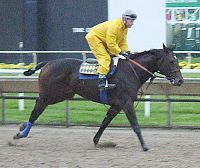 Another Baffert trainee, Bull Market, galloped this morning. 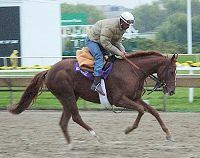 Local hero Most Feared, winner of the Arlington-Washington Futurity, galloped 1 1/2 miles. His trainer Ronny Werner said: "I'm really hoping for a deep, laboring tack. I know my colt can run all day. The rain's pobably going to tighten up the track and benefit the speed." Baffert has both the second and third choice in the Juvenile Fillies. Here is the first, Santa Catarina. Baffert's other filly Composure galloped in company with Bull Market. 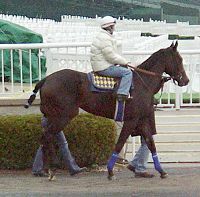 Frank Stronach and Allen Brian's Buffythecenterfold, listed at 12-1 for the Juvenile Fillies, galloped 1 1/2 miles. 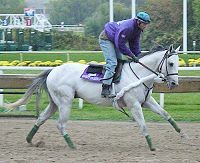 California longshot Sea Jewel, a 50-1 outsider for the Juvenile Fillies, was under a tight hold during her 1 1/4 mile gallop. Filly and Mare Turf second choice Islington schooled in the paddock with Golan then breezed 38 flat on the turf and jogged around several times. 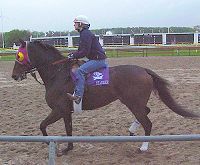 English Filly and Mare Turf entrant, Gossamer, cantered 5 furlongs on the turf course and was credited with a 39 4/5 3 furlong workout on the turf. 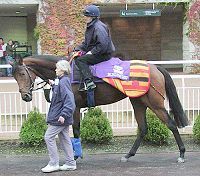 Trainer Luca Cumani said: "It was just a light canter, not even a breese. I just wanted her to stretch her legs." Riskaverse, rated at 15-1 in the Filly and Mare Turf, jogged once around the track the wrong way. Co-third choice in the Sprint at 5-1 Swept Overboard galloped 1 1/4 miles. Canadian champion Wake At Noon prepped for the Sprint with a 1 1/2 mile gallop. 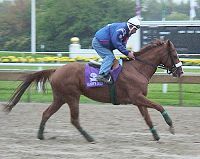 Mile entrant Medicis, trained by Criquette Head, worked 34 1/5 on the dirt. 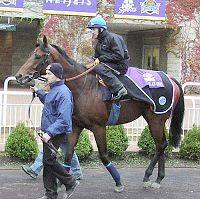 French based Domedriver, trained by Pascal Bary, prepped for the Mile with an easy canter around the main track. 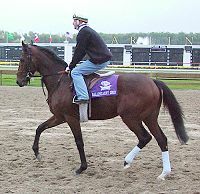 Mile longshot Nuclear Debate, who hasn't won since the Nearctic Stakes at Woodbine, was out for a gallop.